I recently picked up a kit to make your own lemon clock. It comes with everything you need, except the lemon itself. I tried it with a lemon, as instructed, but also with a lime, a sweet potato, and an apple. 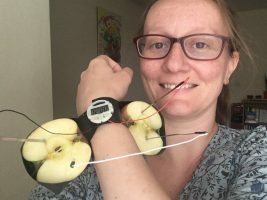 Because if you can make a lemon clock out of a lemon, why not make an apple watch out of an apple? Perhaps it wasn’t as lightweight as most Apple Watches. I also had some trouble installing apps on it. On the other hand (or the same wrist, if you will), it was certainly a lot cheaper than the conventional watch, and I made it all myself! In the video below, I explain the chemistry of the lemon battery, and I show how I turned a lemon clock into an apple watch. The lemon clock works because the zinc and copper electrodes react with the lemon in different ways. At the zinc electrode, zinc ions dissolve into the lemon juice, leaving electrons to travel through the wires and clock to the copper electrode, where they react with hydrogen ions from the acidic lemon. This creates a small amount of hydrogen gas. The flow of electrons through the battery creates a current (in the opposite direction) and that’s what makes the clock work! Because the only necessary part of the lemon are the hydrogen ions, you can use any other acidic fruit. That’s why it works with a lime, a sweet potato and an apple as well. It also works with regular potatoes, by the way. I just used a sweet potato because I knew I would have to eat all this food later, and I prefer sweet potatoes. I’ve previously explained the science of bath bombs and of the Kracie Popin Cooking Sushi kit. What kit or toy shall I tackle next?